ATRIA is a sound installation created in collaboration between the artist Deborah Robinson and David strang. 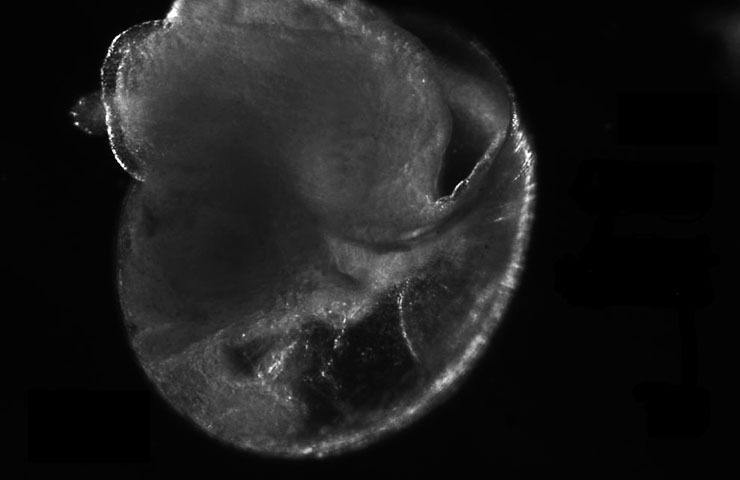 Working with microscopic videos produced by researchers in the Developmental Ecophysiology group ( Oliver Tills, Simon Rundle and John Spicer), that enable the measurement of key points of development in the heart of marine snail embryos, the project aims to re-trace and map these developments through sound and space. The projects evolves acros the 3 stages of development in the larval and, then, adult heart. Stage 1 represents the larval heart, Stage 2 represents the larval heart and the adult heart together and Stage 3 represents the adult heart. These developmental stages are then resited into the 3 atria of the Portland Square building at Plymouth University with speaker arrays placed in each atria (up to 52 speakers). Atria 3 - sound generated by the adult heart. The sound moves through the building as the development video changes. This project was funded by the Faculty of Science and Technology at Plymouth University.